Save on average 40-50% off dealership prices so make us your dealership alternative. Request a quote to see how our prices compare to a quote from your dealership. We have combined experience of over 35 years of working in multiple dealerships & aftermarket shops. Layth and Basil are certified as GM World Class Technician, GM Master Technician, ASE Master Automobile Technician and more. We carry A/C Delco, MotorCraft, NGK, MOBIL ONE, DORMAN, BOSCH, HITACHI, DENSO, CARDONE, FEL-PRO and OEM parts. We deliver a personal customer experience. Come by or contact us. We offer a multitude of high quality services and repairs to get your vehicle running in top quality condition. Read more to learn how we can serve you! Trusted by many throughout the DFW See our testimonials on here! Or out 5 star review on social media! The bill for accidents resulting from unperformed vehicle maintenance tops $2 billion a year according a 2004 study by Car Care Council. Come to us to have your car in good hands. We offer specials in addition to our great prices! Read more to see how you can save money. Our Suburban’s sun roof broke in the open position. Layth was able to find us a salvaged sun roof for $900 LESS than a new replacement. He installed it beautifully and handled FIVE other things on our repair list. We were so encouraged by his honesty, integrity, and genuine concern with doing what is best for his customer. We plan to return to him for future needs and are trying to spread the word about his great work. Layth has the best shop in the metroplex. Layth will fix your cars and help you buy and sell vehicle as well. We never worry about the health of our vehicles anymore. This is the only shop we go to. Thanks for all the help Layth. Best Shop in the Dallas, Richardson Area. Thank you Layth and Basil for the excellent repair job you performed on my car, your good work exceeded my expectations. Layth’s thorough inspection and good mechanical knowledge and highly respected manners and reputation makes him a very well trusted car dealer as well. Goodwrench Automotive did a great job on my car! Before doing the work, Layth called to give me the choice between Nissan or after market parts and he gave me price quotes for each option. I felt at ease. They were honest and friendly, did great quality work at a fair price, and they did it speedy fast. Couldn’t ask for anything more. Not going back to the dealership for service. I was introduced to Layth by a neighbor because my wife’s car was having some engine problems and we needed a good reference. Let me tell you that we are elated to know such a fine person (Layth) and company to assist us with our automotive needs. Now all our vehicles are serviced by Layth because we trust the work will be top notch and in a timely fashion. It is nice to know that he personally stands behind all his work. I was referred to Basil and Layth by a friend, who worked with Basil at a franchised dealership. I have never taken my vehicle to an independently owned automotive shop and was a little cautious, but felt comfortable enough to call to schedule a service appointment, because they were highly recommended by my friend. I must say that Basil and Layth not only put my mind at ease, but they continue to exceed my expectations and that is difficult to do. I have brought my vehicle to Basil and Layth for several visits, including major repairs, and these gentlemen are the best. Not only will Basil and Layth give you an idea of what your vehicle concern(s) may be, they also keep you updated with the progress of the work. Having worked in the automotive industry for nearly twenty years, I know how it feels to take your vehicle to a facility for repairs and, on average, it is not the most pleasant experience. I can honestly say that I enjoy seeing Basil and Layth, because they are very courteous, pleasant, and respectful gentlemen. 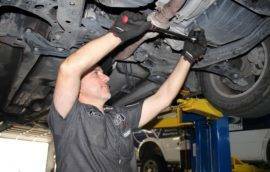 I do not trust just any facility with my vehicle and I was not happy with the previous service facility that performed the work on my vehicle, but I am very happy with Goodwrench Automotive and I highly recommend this business and Mr. Basil & Mr. Layth to anyone in need of Great service work at Affordable prices by Honest people! Goodwrench Automotive is by far the best place I’ve ever been to get my car serviced. I’ve traveled across the country and have gotten my car repaired at various places but never has there been such professionalism and genuine kindness to customers as Goodwrench Automotive. I work for one of the largest automotive retailers in the United States and after having their service department look at a problem I was having with my car they could not discover what the problem was and recommended I bring the car to Goodwrench. That alone spoke volumes to me. The problem was diagnosed and fixed in no time at a very reasonable price. I could not have been happier. God bless you for all of your hard work Layth and Basil! I would like to let everyone know that I highly recommend Goodwrench Automotive for any vehicle repairs and troubleshooting needs. I was having a problem with my Buick skylark getting the state inspection. I was told by an un-named repair company to take my vehicle to an automotive electrical specialty shop to diagnose why the emissions computer would not read my vehicles information. They kept my vehicle for 5 days and this was all they could tell me. I took my vehicle into Goodwrench Automotive and was called less than 2 hours later with the problem and solution to my vehicle, and the state inspection was completed without issues. They have now earned all my repair needs in the future. Thank-you for your honest and speedy service. I will pass along your name to anyone who has vehicle repair needs. Recently, I had a 100,000 mile service completed on my 2003 GMC Sierra. I wanted it to be perfect as I am giving the truck to my parents to travel in. I asked Layth to check it and tell me anything that needs to be repaired or replaced – and then just do it. I am happy to report that he found only 2 items, explained that they are not an emergency but would be good to take care of now, then explained what had failed in each area. I was very happy with his thorough explanation, fair pricing and quick service. I will go back to Layth and have already recommended others to him. I had gotten some work done on my car a dealership and they told me that I needed rear brakes and rotors. I was leaving for a trip to Wisconsin and needed it fixed within 2 days. I brought my car here and right away was greeted with professionalism and courtesy. The owner said that before he quoted me a price he wanted to take a look and see if I actually needed rotors. Within an hour I got a call saying that he could save the rotors and all I needed was new brake pads. As a new resident to the Texas area I think I’ve found my new garage. Highly recommended. I am very pleased with the work done on my 1994 Camry. Layth knows what he is doing, and does the job he says he’s going to do. Even though this was my first time to have work done here, he treated me as though we’d known each other for years. I highly recommend Goodwrench Automotive! Layth completed the repairs on-time. He does great work. Cost were fair. His focus is getting the job done right, not being the least expensive. Highly recommend! I have taken my 2006 Camry to Layth, the owner, on several occasions and he has always done the work quickly and at a very fair price. 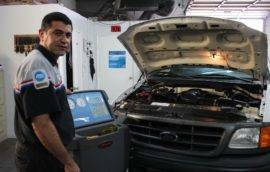 If you are looking for an auto technician who is honest and very knowledgeable, Layth is the person to see. The service is excellant. I have highly recommended Layth to all my friends and family. Although he is a world-class certified GM technician he seems to work on all makes and models of cars. I think he can do about anything you need from oil changes to transmission work. I recently had to have immediate repair to my 2009 Chevrolet Malibu. I was referred to Layth by a good friend of mine and have to say I was not disappointed. Ive always been skeptical of car repairs in general but feel that Layth gave me immediate and full attention. He walked me through all scenarios and has even followed up with me to assure I was satisfied. Goodwrench Automotive is where I will now be taking my vehicle if I ever need to again. Thank you Layth! I had a major engine oil leak in my Chevy Suburban and I went to couple of places to get estimates on the repairs and all those places were high and i finally was recommended by a neighbor to go see Layth at Goodwrench Automotive and let me tell you something, this guy is honest, fair, and on time with his treatment and the care he gave me and my vehicle. He even picked up my vehicle from Frisco and took it to his shop fixed it and returned it back to me in couple of days and it was the oil pan gasket and the rear main seal. I was amazed with the number of awards that he earned from GM as a technician and also a verse from the Bible that says “Trust in the Lord with all of your heart”. I will recommend everyone I know to this guy because I was treated right at his shop. Layth Good luck with your hard work and I assure you that I am happy 100% with you. 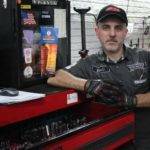 I found Goodwrench Automotive online after researching numerous negative reviews of big-name auto repair shops in the Dallas area. I was in search of a reputable mechanic that I could rely on for all of my vehicles needs. After shopping around and getting some quotes for new brakes, I decided to go with Goodwrench Automotive. Layth did the brake job using high quality brake parts for half the price of the dealership. Layth is very professional and runs his business with a high degree of integrity. What I appreciate most about Layth is that I know I can trust him as well as his work. He takes his time with each of his customers and explains both the technical side as well as the financial side of the transaction. Most recently, I contacted Layth for a second opinion on something. He generously took time out of his day to look at my vehicle on short notice. He confirmed it was not necessary to have the work done that one of the big shops had recommended. Now, Layth is my go-to-guy for ALL my vehicles needs because I don’t trust anyone else underneath my vehicles hood. For budget-conscious individuals who do their own homework, I recommend Layth at Goodwrench Automotive. When my vehicle needs service, I no longer have to begin from scratch researching and shopping around. I take it to Goodwrench Automotive and I am happy to refer my friends and family as well. I recently had a full service performed on our Nissan pathfinder, I was very pleased with the service, saved a good amount of money, and time. The customer service was excellent. It is really hard to find people you can trust these days, but Mr. Layth was very honest and professional, and he basically knows what he is doing, I hope we had many like him. Thank you Layth and God bless you and your business. We had Goodwrench Automotive repair our Expedition for the same problem that was allegedly “fixed” by a Ford dealership six months earlier. Layth did a great job of repairing the SUV and even fixed a couple of minor things he noticed while test driving it afterward. Great service and very reasonable prices. If the need should arise in the future, we will definitely be using Goodwrench Automotive again, and will be recommending them to our friends and family. I recently had a few problems with my Chevy Trailblazer and my stepson who works at the GM training center in Garland told me, “there’s a place called Goodwrench Automotive that a friend of mine owns and I promise that you will be 100% satisfied”. Layth diagnosed my water pump problem quickly and also performed transmission and oil change services on my vehicle. I’ve been a GM owner for over 35 years and I’ve never met a more honest gentleman in the auto repair business. I highly recommend Goodwrench Automotive for the best service and price anywhere in the DFW Metroplex. My wife’s car was in need of major repair. I took it to Goodwrench Automotive. Mr. Fadhil was able to save me a lot of money on the labor compared to dealer prices. He even used factory replacement parts, not “Made in China” crap. The work was done on time and I am very pleased with the vehicle now. His shop is conveniently located and also kept very clean. I have referred several of my friends to him and will continue to do so. Factory Parts, Not "Made in China"
As owner of a limousine service for over 15 years, we have been through a lot of vehicles during that time. It is necessary that we keep our vehicles in top notch mechanical condition. I met Mr. Fadhil shortly after I purchased a new Chevrolet Suburban. Today that Suburban turned over 374,000 miles!!! Thank you Goodwrench Automotive. An honest mechanic is hard to find but I found one in Garland, TX! I went in for an oil change and will definitely be going back for other services on my car. The owner was professional and quite knowledgeable in his field. His office is filled with awards, certificates,and a trophy representing his mastery in auto mechanics and repair. I am not a car person whatsoever and I appreciated how Mr. Fadhil explained things in terms that I could understand without being condescending. It’s very refreshing to walk into an auto shop as a woman and be treated with respect as this company treated me. I also appreciated how he didn’t try to sell me services or parts that I didn’t need. He spotted a problem with my tires and took the time to show me how to spot worn tire treads. I have to say that I know more about tire treads now than I’ve ever known! The waiting area was clean and comfortable. The service was efficient, thorough, and affordable. The peace of mind I got and the assurance of quality was worth the extra distance I drove to get to this place. I will definitely be going back again and again and I will be telling my friends about it! was SIGNIFICANTLY less than the dealer and other auto repair shops. Nonetheless, I was still bit concerned because I thought Layth was only good at repairing American made cars. However, after speaking with him, I was quickly put at ease because I could sense he was very knowledgeable about all type cars and car repairs. I also could sense he is a man of great integrity that wasn’t out to take advantage of anyone. I am so glad I decided to use his service. It’s very comforting to have a mechanic that is trustworthy and gets the repair done right the first time and for a great price. We have had both our cars serviced with Goodwrench Automotive. Always received excellent service, fair pricing and personal attention. Recently, my wife was having problems, car would not start. The extensive diagnostic testing showed to be a very minor problem. The HONESTY AND INTEGRITY of these men was paramount. I would recommend their service to anyone. Welcome to Goodwrench Automotive where our number one goal is Honest Work at Affordable Prices. We are a family owned and operated repair shop. We have combined experience of over 35 years of working in multiple dealerships & aftermarket shops, so you know that your treasured vehicle is in good hands. Whether it’s a minor repair or a huge overhaul each case will be looked at individually and given our full attention by our ASE Certified technician. We pride ourselves on good workmanship, great customer satisfaction and affordable prices. We carry top of the line brands like A/C Delco, MotorCraft, NGK, MOBIL ONE, DORMAN, BOSCH, HITACHI, DENSO, CARDONE and FEL-PRO. We source high quality parts from the DFW area to quickly service your vehicle. The shop takes pride in being up-to-date, clean and efficient to get your car, truck or SUV in and out as quickly as possible. We also offer FREE WIFI, Coffee and a family atmosphere.